Native title is fundamentally a moral issue, despite the fact that it has become embroiled in party politics. The real question is not which party will govern the country, but whether indigenous Australians will be squeezed out of the right to follow their customs without impinging on the property rights of other Australians. Native title is a cultural and spiritual concept. It does not mean, for example, the owner of a Pitt Street building being pushed out by tribes that were there before white settlement. It is not a question of indigenous Australians seeking, as the prophet Isaiah puts it, to “join house to house and lay field to field till there be no room” (Isa. 5:8). Before 1788, there was of course no ownership of property in the modern sense. Aboriginal groups respected each other’s rights when travelling into neighbouring territory. The European settlers pretended, however, that Australia was “terra nullius”. Nonetheless, in parts of Australia pastoral leases provided that Aboriginals could use Crown land for hunting, food gathering, water collecting and traditional ceremonial purposes. 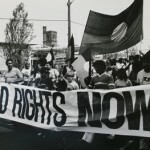 This sharing of land was acknowledged by the High Court in the Mabo case, which recognised that the rights of indigenous people to continue their customs – “native title” – was part of the common law. “Native title” means having access to certain land, for specific traditional purposes. Who owns the land is not the point. Claimants to native title are not seeking to be owners who can sell the land and keep the money. Native title is about co-existence – not as business partners but with different dimensions of interest. Are there any Jewish analogies? The Torah speaks of the Children of Israel seeking access to traverse certain territory on the way to the Promised Land. They promise not to harm the property or interfere with the inhabitants’ rights (Num. 20:14-21, etc.). But this is not the same as claiming native title, because the Israelites were not the indigenous inhabitants. Another passage might be more relevant, when it says that no-one may acquire land in Israel in perpetuity but in the jubilee year property (except for houses in a walled city) reverts to the original owner (Lev. 25:8-55). Hertz calls this “a rare and striking introduction of morals into economics” (Hertz Chumash, p.532). Again the analogy is not exact, but it shows that the original owner had not lost all significance. In a sense the best Jewish analogy is the centuries in which displacement from the land did not prevent an on-going spiritual and cultural bond with the ancestral territory. Obviously what the far-flung Jewish people yearned for was not only to walk on the ancient sites and practise Judaism in its authentic setting, but to acquire ownership with legal deeds like that which recorded Abraham’s purchase of Machpelah (Gen. 23). Native title is not about legal deeds of ownership, and Pitt Street is not under threat, but Judaism understands the hurt and deprivation when a people cannot follow its traditions on the land to which they are spiritually linked. Jews therefore have a moral duty to ensure that native title is respected. This entry is filed under Aboriginal Recon., Articles.